This little guy is a result of Ferrari and Abarth getting together, and I think it might be one of the best looking Fiat 500s I've seen. Add to it a tuned 1.4-liter turbocharged engine making 180 hp mated to a F1-style six-speed, and you've got a performer, too. The vehicle, called the 695 Tributo, will debut at the Frankfurt Motor Show. Doesn't Fiat own Chrysler now? What do you think the chances of them importing this are? Yes, Chrysler is owned by Fiat now (or will be very shortly). Fiat/Chrysler has already said the U.S. will be getting the 500, which is great. Chances of this particular model hitting U.S. shores? Probably pretty slim. 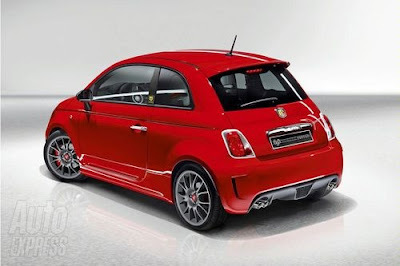 Fiat did say we are getting the Abarth edition, although it will be named something else. Who knows? But I agree that this most likely will not make it over here. I'm sure they will not be making that many examples of it either. I agree. It's a super niche market thing for Europe, I'm sure. Like I said: I'm just glad the U.S. will get the 500 at all (including the Abarth). It will be interesting to see the head-to-head comparos between it and the Mini.